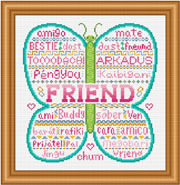 Many words used for “Friend” in various parts of the world are listed inside a butterfly shape. Three hearts and word ‘chum’ are outside. Colors may be changed. All whole stitches are used. Download Only: $5.99 You will download the pattern. Nothing will be mailed, so you pay no printing or shipping charges.